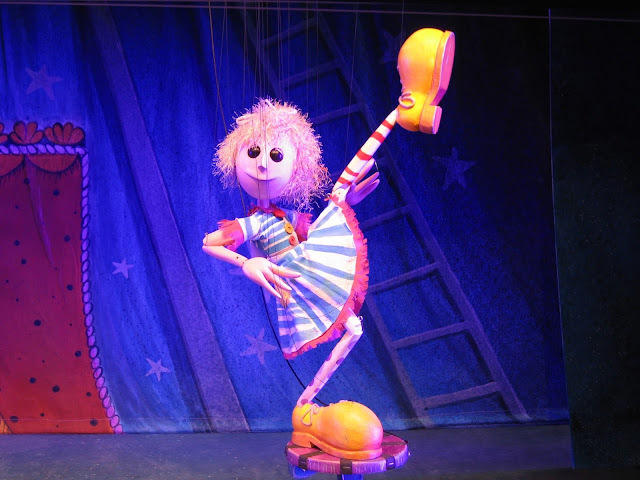 Last week we were invited to see the new Cinderella Della Circus show at the Center for Puppetry Arts. I've always wanted to take the kids to the Center, so I was so excited to go. The Cutes didn't know what to expect, but they loved it! It was day five post vacation of nothing but rain, so this opportunity came at the perfect time. After a week of playing in the sunshine on sandy beaches to being trapped in the house, they were going a little stir crazy. We were all ready to get out of the house. We arrived just as the show was starting, and the kids were in awe of the whimsical stage. 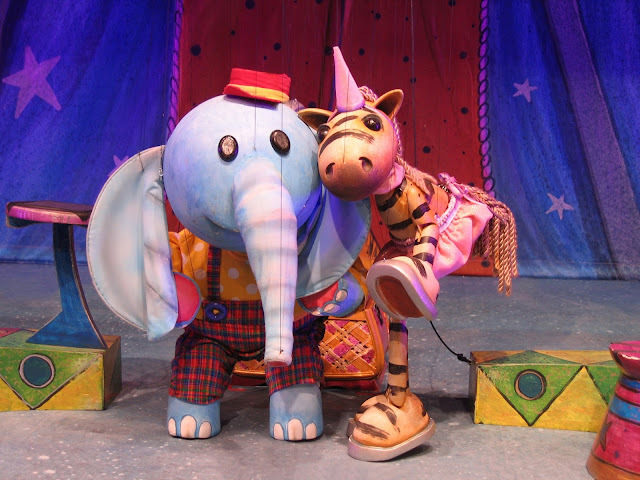 The Cinderella Della Circus show is part of the Center's family series. It follows the classic fairytale of Cinderella, but with a fun circus themed twist. It was cute and funny, and all around a great family show. The show runs until July 23rd with several performances each day. If you are in Atlanta and want a little break from the heat, or if you are visiting Atlanta this summer, I would highly recommend it. The Cutes loved it, and already have been asking to go back and see another one of the shows in the family series. Now knowing how much they enjoyed the whole experience, I definitely am planning to bring them back sooner rather than later. After the show, attendees were able to head upstairs to the workshop area to create their own puppet character from the show. The kids were so in awe of all the puppets hanging on the wall, and we learned that you are able to actually purchase several of the puppet making kits in their gift shop. The Cutes couldn't wait to create their very own Stretcho rod puppet, and got to work right away. After the kids completed their Strecho puppets, they were able to put them to work. The workshop room has a little curtain and stage set up for the kids to create their own puppet show. They had a blast doing this, and I had a hard time getting them to leave the room when time was up. After their Stretcho shows had taken their final bow, we took advantage of the free time to check out the museums on site. The Cutes loved walking through the Worlds of Puppetry Museum and checking out all of the different puppets throughout history. They enjoyed the hands on portions and being able to interact with several of the exhibits themselves. The Jim Henson Collection might have been their favorite - if only because it was filled with characters that they recognize. It was fun for both the kids and I to learn about Jim Henson, and see how much work, effort and creativity goes into each every one of the characters that we have all grown up with. Some of the puppets on hand were life size. There was a large Big Bird, and my personal favorite - Miss Piggy. This section also had several interactive exhibits. Their favorite part by far was the area that let the kids learn how puppets were seen on the big screen. They made up different scenes, played different characters, got to interact with other children, and of course, see themselves on camera. They loved every bit of it. And I'm pretty sure would have stayed until closing time if I let them. The whole experience at the Center for Puppetry Arts was so much fun. The Center has a little something for every interest and for all ages. They are always putting on fabulous events, fun camps, and great shows. I can't believe what all we have been missing out considering how close to home this is for us, but now that I know, we will definitely be back soon. 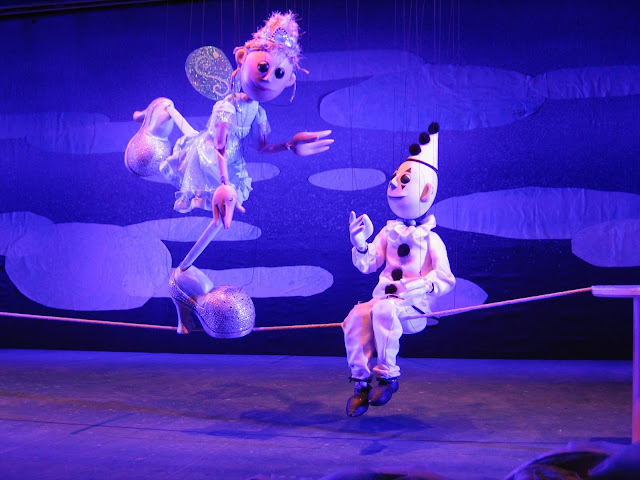 What has been your favorite show to see at the Center for Puppetry Arts? What should we see next? Or do you have a puppet theater in your town - share with us!